Housewife Duties - Coming Soon! I'm near actually finishing the main story so the mod probably won't have another update until it's finished! After a normal day of cleaning and housewife duties, she drops off Lisa, Bart and Maggie at Milhouse's but as she returns home, she finds that Homer has eaten all the Lovely Sounding Ice cream with mini pies in. After going to the shops, events unfold, but I'm not saying the events, you can find them out yourself. 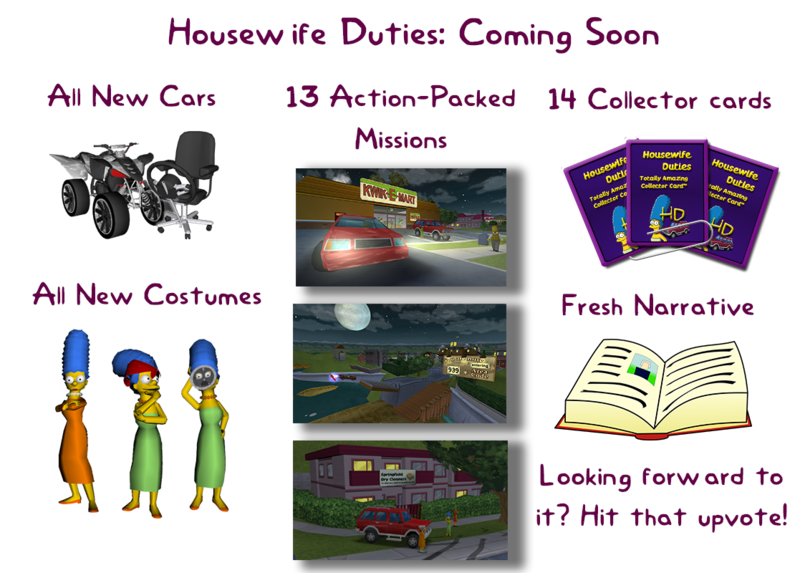 New Missions: Missions to play as you explore Springfield to find out who is behind all the weird stuff happening around the town you live. New dialogue: Totally amazingly edited dialogue to suit the plot and make it easy to follow. No Aliens! : Thank God no more Aliens, they annoy the hell out of me. New Cars: New cars that tell the story and also add a bit of fun. This is the original version of it. 0.32. Enjoy. I believe Max had already mentioned me before, but I wouldn't mind trying out the Beta if you're looking for testers! I will admit the mission images made me go "Oh cool" rather than "Oh nice", however. Koopa I'd be interested in being a beta tester. I'd be interested in being a beta tester. Mike Sounds neat! I'd be willing to play the beta. Sounds neat! I'd be willing to play the beta. Sparrow Beta testers: Kenny Giles Koopa YoursDiddlyTruely Max Walker Might be willing to do five if anyone else is up for it. I will be making a Discord soon for it. Might be willing to do five if anyone else is up for it. I will be making a Discord soon for it. Thomas Donofri I am up for it. I'm a bit late to the party though! I am up for it. I'm a bit late to the party though! MultiFan It really has potential! I might be up for it too. It really has potential! I might be up for it too. Collector cards nowhere near done! Missions 0-2 and a bonus mission are included with other surprises.